Aptly titled "Explore the All-New Apple Music," the part how-to guide, part promotional commercial is set to the upbeat track "Where You At" by the Bohicas. At 1 minute and 21 seconds, the ad is longer than most recent Apple Music spots, allowing time to dive deeper into the app's user interface and updated feature set. In the ad, Apple uses the app's bottom row of navigation icons as a scene template, offering a brief look at the features included in Library, For You, Browse, Radio and Search. First up is Library, where users get quick access to all their music, whether it's stored in the cloud or downloaded locally on iPhone. Apple shows off the Contacts-esque Artists view and album cover grid before switching over to curated mixes. Interestingly, the Downloaded music section, highly touted during Apple's iPhone 7 event and subsequent TV commercials, is not featured in today's ad. Apple instead opts to delve deeper into For You, and provides an example of how to set up the music curation function by tapping on floating bubbles containing genres and artists. Borrowed from the old Beats Music app, the setup procedure generates a taste profile that combines with iTunes listening data to deliver user-specific customized playlists. With iOS 10, Apple Music adds two new options in My Favorites Mix and My New Music Mix, both of which incorporate a blend of human and algorithmically curated content. Next up, Apple previews music sharing and offline listening accessed through the three-dot contextual menu that appears throughout Apple Music. Search and Browse are quickly glossed over to get to nearly 20 seconds' worth of Beats 1 radio promotion. The ad cuts between Apple Music's Radio UI and video footage of interviews with big-name musical acts. Also featured are shows from Beats 1 DJs Zane Lowe and Julie Adenuga, as well as those hosted by celebrities. Apple reminds viewers that Radio content can be streamed live or replayed in-app at a later time. 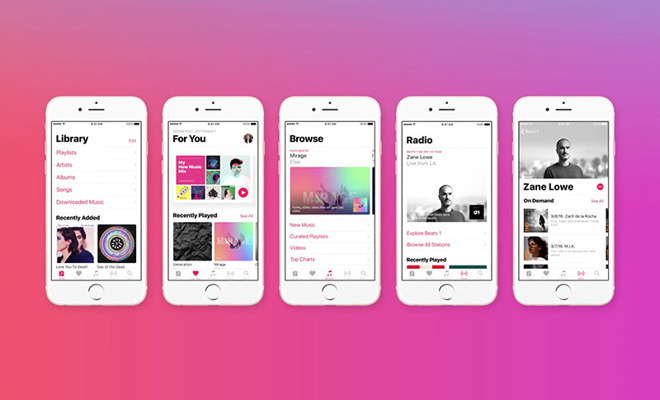 Apple is making a concerted effort to expose its subscription Apple Music streaming service to a wider audience. Last month, for example, the company enlisted the help of James Corden to create a humorous ad starring execs Eddy Cue, Jimmy Iovine and Bozoma Saint John.